This image was captured in 2005 as my family traveled from Vienna, Austria to Buchs, Switzerland. 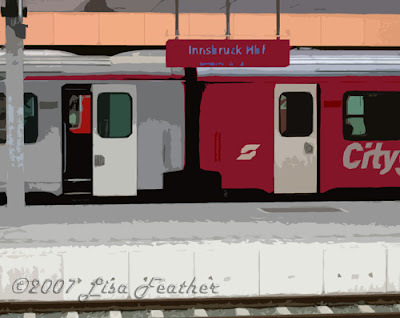 As we sat in our train car during a brief stop at the station in Innsbruck, my husband captured this view of another train waiting at the platform in the station. Something about the original photo captured my attention. I loved the contrast between the train cars. I was attracted to the simple distinct colors. I noticed the borrowed view, of another train behind the one featured, that could be seen through the open door. I was also struck by the significance of the doors on the train cars, one open, one closed, and the differences that can make to our perceptions. My treatment of the image seeks to enhance these striking qualities.